Home / Muted shades with bright, bold colours, the idea of beginning, bubbling, growing and changing. Muted shades with bright, bold colours, the idea of beginning, bubbling, growing and changing. Lizzie follows her heart and recently launched her own design studio deep in the Cotswold Countryside. She named it Anatole, meaning ‘sunrise’ in Greek Mythology and a bright new beginning it was. Her colour palette is eclectic. She is interested in the dialogue created by placing subtle, muted colours alongside bright bold ones. The effect is startling, bubbling, random and unfettered as if to disturb the sensibilities and echo the origins of life itself. The ‘Counter balance 17’ Fabric Collection is a Lizzie Weir signature in the sense that it couldn’t belong to anyone else. It’s wonderful disordered quality is inspired by the drawings and prints of 1950s designers with heavy use of line and block colours. The shapes emerge from shadow drawings of balls of wire found on Lyme Regis beach. Out of the minds of babes and sucklings. 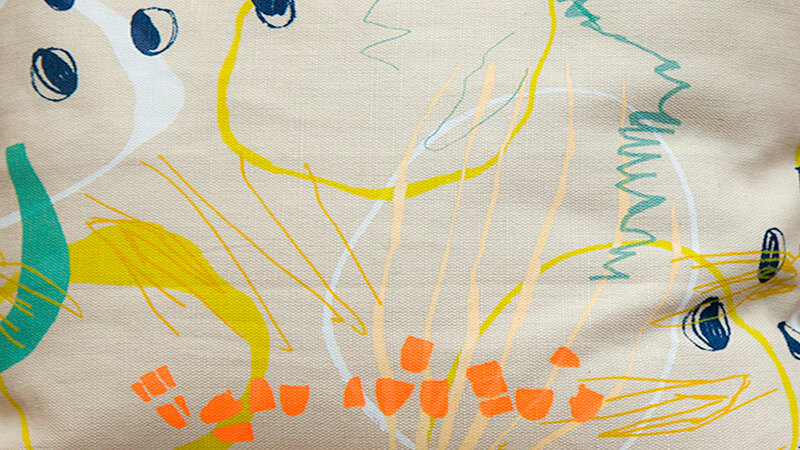 The X and Y Fabric Collection is a result of Lizzie drawing with her seven year old son who was engaged in some work of national importance with pencil and paper. A series of repetitive shapes began to emerge and Lizzie noticed that his style mirrored her own: listening to others and drawing when he was meant to be listening. Drawing to solve problems, to create problems and drawing for drawing’s sake. She began to scrutinise the designs – the lines, the repetition and variation and X and Y started to appear. She cut up the designs creating blocks, geometric shapes and spaces. The printing designs are potentially infinite and the results are fascinating, oddly mathematical – and beautiful.